This is a handy reference manual for five-string banjo players who are interested in the three-finger style of playing. 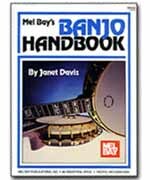 Designed to give a quick explanation of the proper or most common method for playing the banjo in various situations. Sections include Banjo Set Up, Playing Basics, Chords, 3-Finger Picking, Up the Neck, The Melodic Style, Back-Up, Song Endings, and Playing in Any Key. In tablature. The companion CD is a stereo, play-along recording.